The Danfoss RX-C self regulating heating cable provides a continuous drain path for melting ice and snow to leave a roof through the gutters and into the down spouts. 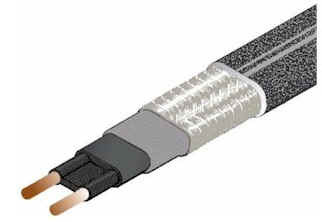 The power output of the conductive core material increases or decreases in response to ambient temperature changes and occurs at every point along the length of the cable such that power output adjusts to the varying conditions along the length of the pipe. The self regulating effect means the cable can be overlapped without creating hot spots or causing a burn out. Maximum energy efficiency is ensured by producing heat only when and where it is needed.